Mini ranch nestled in mature setting on approved ( survey available) 2.2 acres, in Reno County, room for pets, horses, garden, R V's. boats, horse trailers, as you enjoy spacious comfortable move in ready 1998 well kept Oakwood doublewide manufactured home (26 X 66) on permanent continuous concrete foundation, with well arranged 3 bedroom, 2 bath (one master) open kitchen, dining, living room with fireplace area, another formal dining and family room, ceiling fans double pane widows and storm doors. Separate laundry / walk in pantry room. Nice wood decks, trees line north side so secluded off road. Above ground pool stays with equipment. 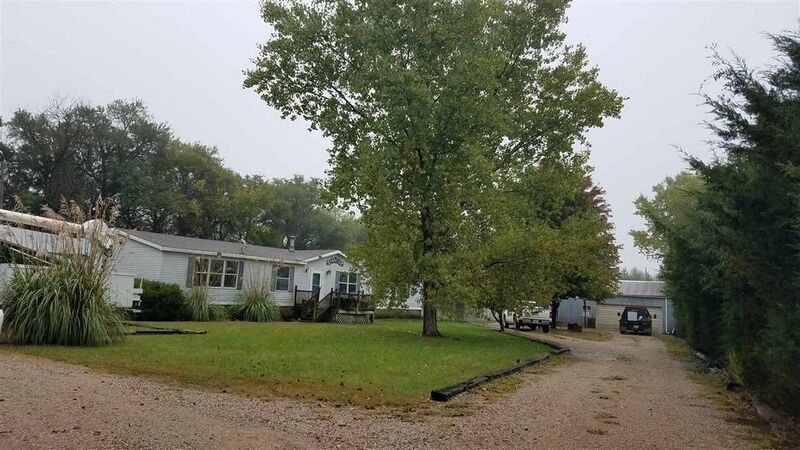 Many mature trees, and maintained lawn, outer area fenced and cross fenced, Detached Garage county shows 22 X32 , and Farm Utility Shelter 32X16 Steel, bldg. shop is wired 110/220 with wood stove, finished area with dry bar, wired, heat and air for out side get away. Pasture for horses. Haven School district, route school bus provided. Has it's own 60' Well drilled by Miller Drilling, and nice lagoon. Double pane windows and storm doors. Remodeled in 2015, (No paneling, is sheet-rocked) . Skylink internet equipment stays, separate laundry, 220, and walk in pantry combined room, gravel road out front, with short distance up road to 14 highway black top, short few minutes distance to South Hutchinson, 45 minutes to Wichita. Heritage roof. Central heat and air. Offering with full price year home warranty, and appliances, of white refrigerator, stove /oven, microwave with exhaust for cook stove built in, disposal, dishwasher, washer and dryer. Easy to see, just need time to get 3 sweet dogs secured. Directions: South of Hutchinson on 96 Hwy , to Cruppers Corner, South at curve, to 14 Hwy and South to Long View, turn West on South side, first residence.